Once we were surrounded by plants, and trod grass and flowers. At night we watched the stars. We fed on food from woods, bushes and wild beehives, and drank water from springs and streams. We lived beside trees, flowers, birds and the creatures of the forest. This vision of a golden age, impossible yet visceral, felt as much as seen, has filtered into the life of every civilization. The naves of gothic cathedrals still soar like bridleways through trees, their vaulting branching and splitting to hold the heavens. Through the centuries they move from simple arches to pinnacles sprouting leaves and flowers. In many Muslim buildings the stars are painted, enameled or shaped in ceilings; in both east and west carpets are woven flowers. The 17th century Wagner Carpet in Glasgow is one of the earliest surviving Persian garden carpets, and shows a four quartered garden divided by water channels with a basin in the centre. It is filled with cypresses, flowering trees and shrubs, and populated with birds, butterflies, animals, fish and duck. Lions, leopards, gazelles, peacocks, storks and pigeons roam. In each of us lies a deep psychic need to create our garden of the golden age, to find our paradise, to achieve balance and order, to know where we belong. This knowledge is our true wealth. Few activities are as varied, healing and sustaining as gardening. 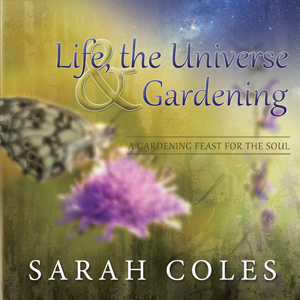 Physically gardening strengthens us, it connects us to the world outside, it inspires and consoles us, and spiritually it restores us at the heart of things. A garden expands every area of our being. What follows is an attempt to explore the wonders in gardens, both our own and others, to learn what they do for us, and what we can do in them. There is no end to its joys, interest and teachings.